We make it easy for you to find the perfect Lift Chair. 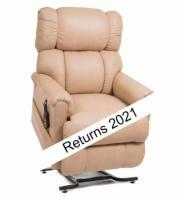 The Imperial, with the articulating headrest and power lumbar system, provides the ultimate in customized comfort. Recline and adjust your head, neck and shoulders for the best positioning using the powered adjustable headrest. The powered adjustable lumbar system offers support for the lower back and the pocketed coil seat system provides sacral comfort.